Please be advised that all of the images and text on the Buon Fresco web site enjoy copyright protection and that United States Federal law provides severe financial penalties for copyright infringement. IF you're an artist or painter, it's ALL about COLOR! 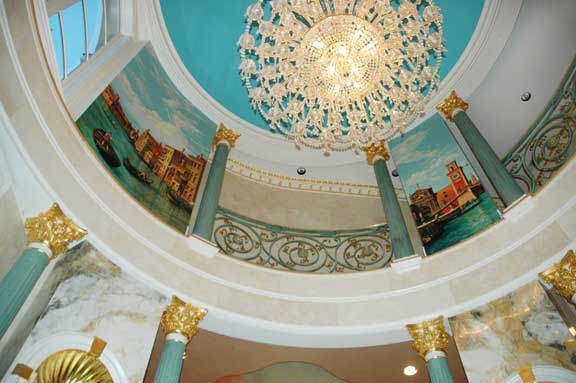 Buon Fresco specializes in creating COLOR compositions that delight the eye - just as a musical composition delights the ear - with flawlessly selected chords of color, form, patterns, textures and reflected light, using Italian Plaster, Paint and Gold. 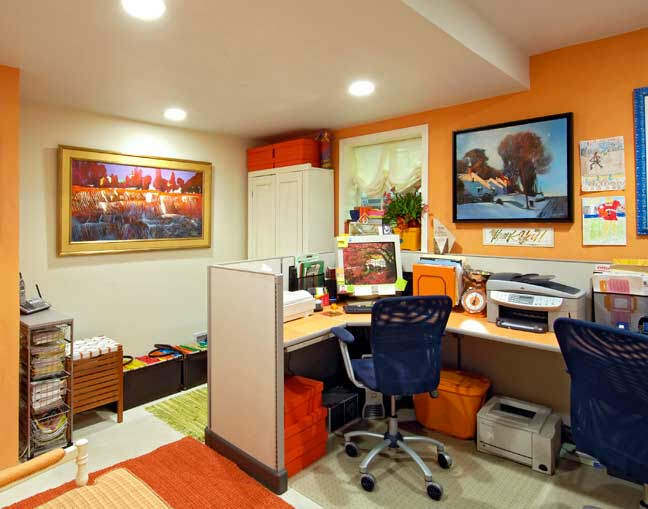 The artistic director of the studio, Victoria Bingham, suggests; "Dressing a beautiful room is not unlike dressing yourself. 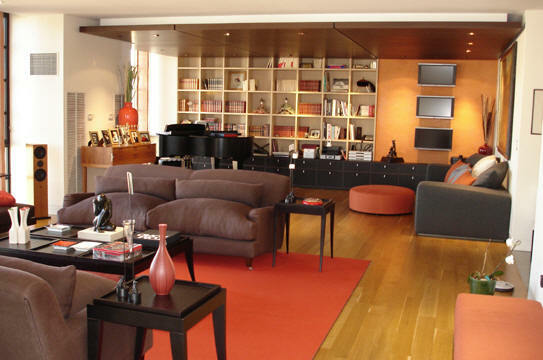 Combine an appropriate blend of texture, color and sheen. For example combining a silk blouse, mohair sweater and leather skirt with a string of pearls, is exciting. An outfit comprising only one of those elements alone, is not. 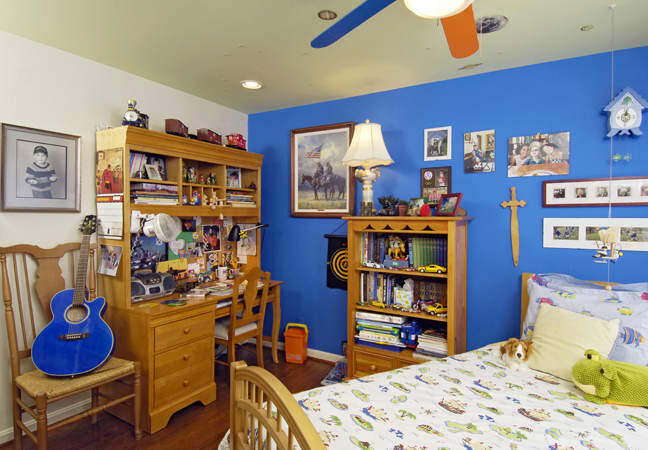 That is the composition aspect of Color. Then there is the process of mixing. 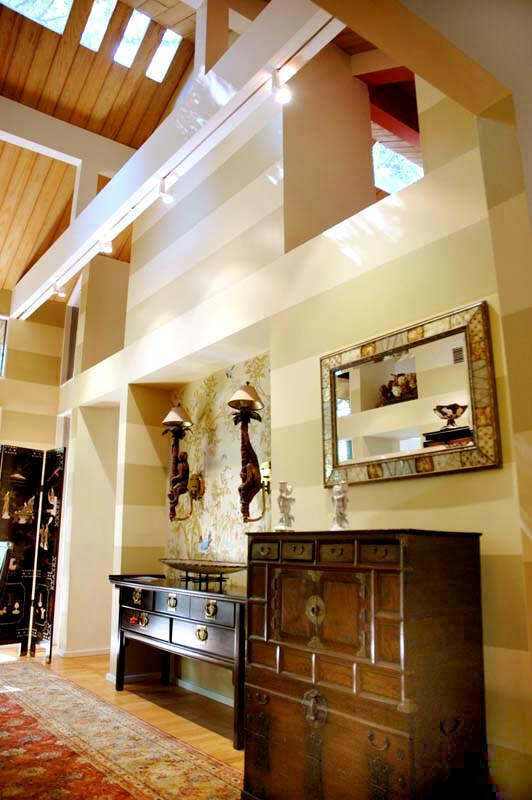 When an architect comes to you and asks for a specific PRECISE color in Italian Plaster, they do not want a 'similar' hue or a higher/lower value. They expect precision from the professional. 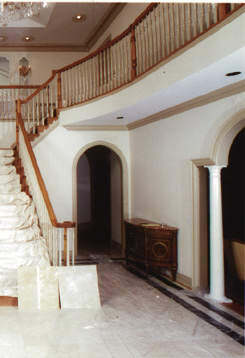 Then after the job is a few years old, and you return to add on, or effect repairs, the plaster needs to be precise. 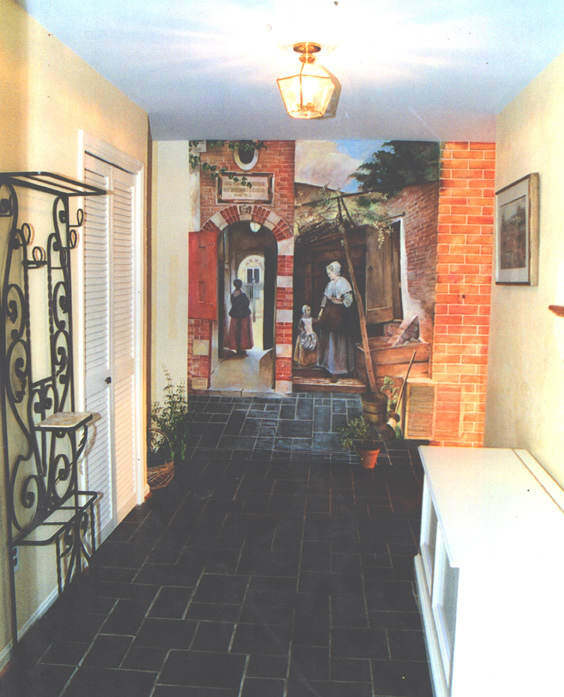 Granted, paint might be prepared for you, but the Italian Plaster responsibility is yours. And in some cases it needs to be mixed - spot on - ON the SPOT. Can you do that with confidence. It can be learned. Scroll down for a view of repair examples done 'after the fact'. WILL CHANGE THE WAY YOU FINISH WALLS FOREVER. WILL TEACH YOU HOW TO MAKE THE JUDGMENT CALLS. WILL SET YOUR WORK APART FROM THE REST. IT'S ALSO ABOUT TEXTURE; ABOUT SHEEN AND.. 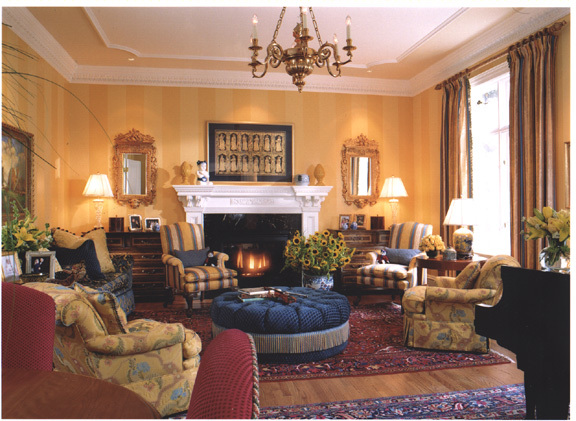 IT'S ABOUT PERFECT COLOR MIXING & EXPERT COLOR JUXTAPOSITION. 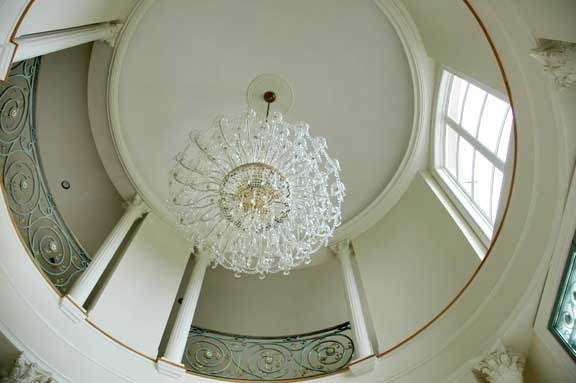 Below Left & Right > Dramatic Before & After Photos of an elegant Rotunda's Finishing. 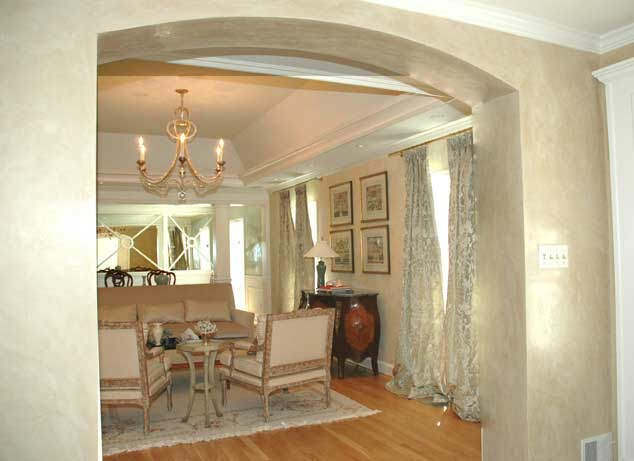 Gray Italian Plaster permits the round Column to recede. 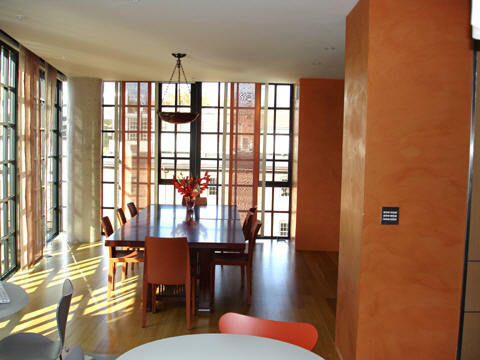 Orange Italian Plaster highlights Focal Walls and adds contemporary drama to the space. 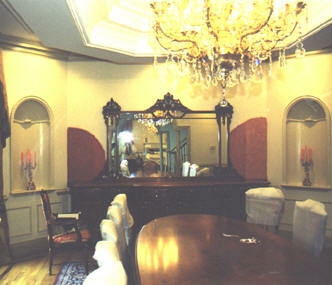 Another Decorative Painting Company painted an offering of Red Faux on the walls. 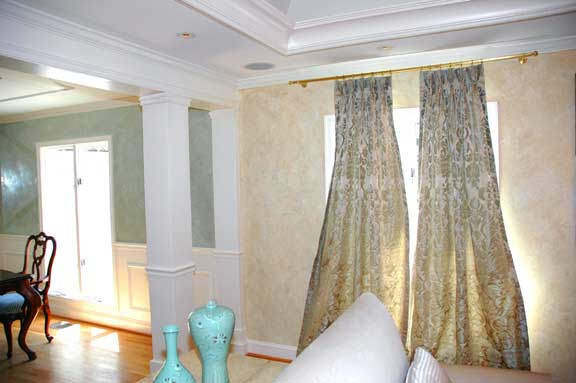 The clients balked and called Buon Fresco... Perfect Color did it! 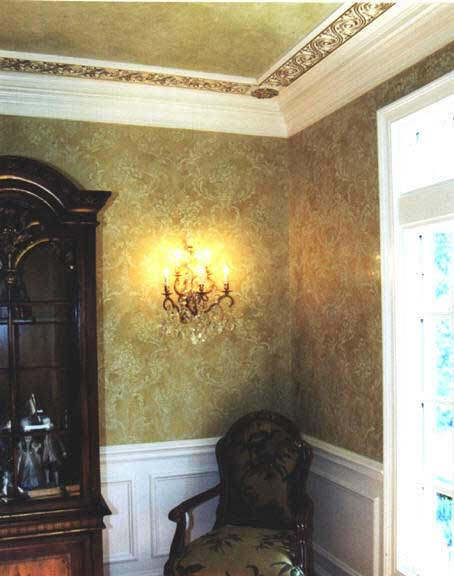 The Green Damask Stripes beautifully compliment. 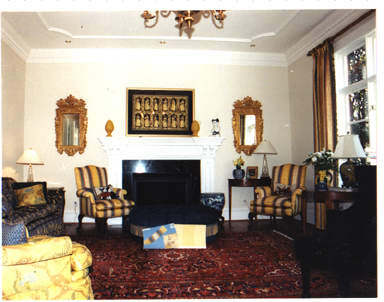 the red furniture. 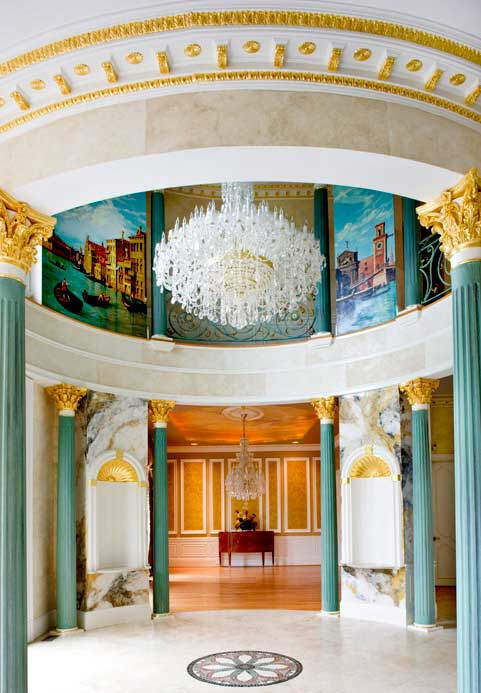 Dual Murals / Gold Leaf complete the work. 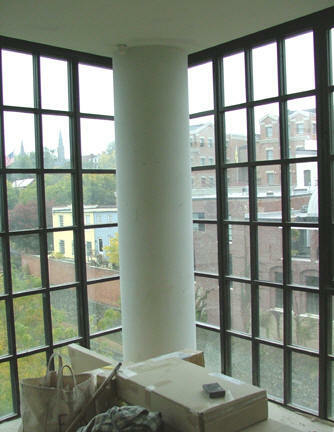 View through the finished rooms of this Virginia home refined by a soft palette Italian Plaster and Painted Glazes Ending in the Dining Room with a high polish Italian Plaster in Robin's egg blue. 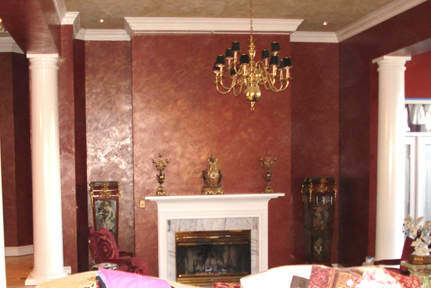 Before > Old Wall paper, Old look; stark and uninviting for a Dining Room setting...- After, Rich treatment of polished Italian Plaster with Damask Pattern overlaid in Matte plaster to compliment very elegant acoutrements. Drab. Uninviting. 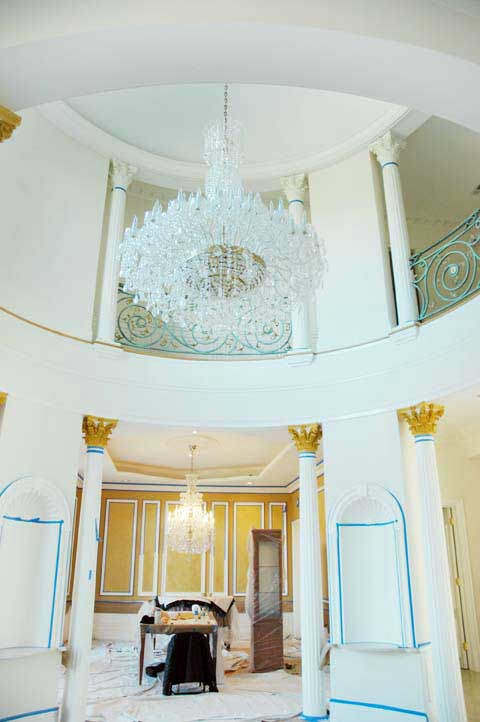 White does nothing for a foyer. A bit of color, and a welcoming mural. What a difference a few days make! 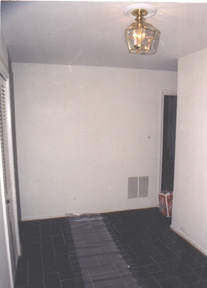 Grand Hallway 'Before'. Needs a strong statement. 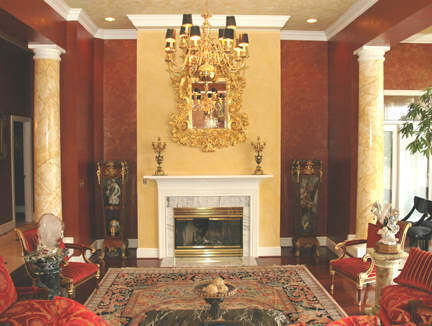 Color Did it!� Columns enhanced, Faux Limestone Blocks added, Trompe L' Oeil finishes Ceiling and judicial amounts of Gold bring out trim details. 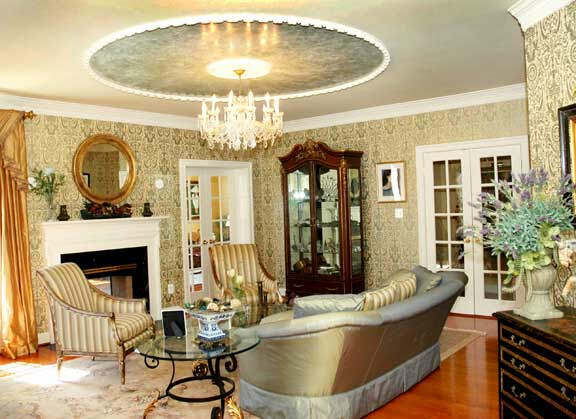 This Focal Wall on the Ceiling brought a cosy-ness to the sitting area in the otherwise large room and created a Color composition that draws the eyes from the sofa to the wallpaper to the ceiling and back. A completion. 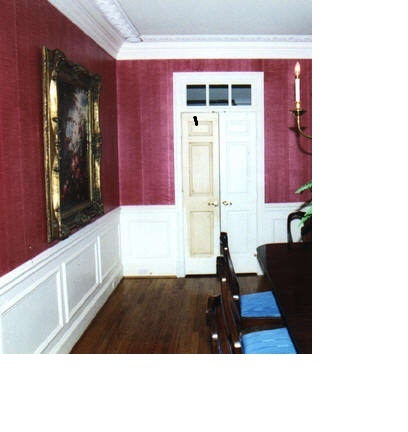 The Color in this room is taken from the carpet and mirror and adorns the high walls and the Chinoiserie Inset wall.